Complete your dining room and achieve an elegant yet majestic look with this seven piece Danville black marble top dining set. The table illustrates sophisticated style with solid marble top over dark wood. 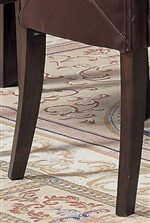 Straight tapered legs finish off the look of the table, providing a grandiose design. 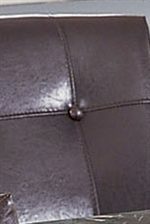 The chairs will not only enhance the look of your home with tufted seat backs and slender tapered legs, but provide you exemplary comfort with the thick upholstered seat and back cushions. Choosing a dining set has never been so easy before, everything will look amazing together and beautifully blend into any decor of your home. Invite all of your guests and impress them with your tasteful style and this classy set. The 7058 Danville Black Marble Top Seven Piece Dining Set by Acme Furniture at Carolina Direct in the Greenville, Spartanburg, Anderson, Upstate, Simpsonville, Clemson, SC area. Product availability may vary. Contact us for the most current availability on this product. Finish & Paint Options Dark wood finish. Handles & Hardware Polished square pull hardware. Case Detail Straight clean edges and tapered wood legs. Description: Top Solid marble top. Complete your dining room and achieve an elegant yet majestic look with the 7058 collection. The pieces illustrates sophisticated style with solid marble tops over the dark wood. 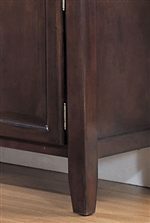 This collection also features clean straight lines, tapered slender legs, and polished knob hardware, creating a refined contemporary look. The side chairs will not only enhance the look of your home with tufted seat backs, but provide you exemplary comfort with the thick upholstered seat and back cushions. Functionality of this collection is provided with the immaculate server, featuring a wine rack for easy access in the dining room. Completing your formal dining room has never been so easy before, everything will look amazing together and beautifully blend into any decor of your home. Invite all of your guests and impress them with your tasteful style and this classy set. The 7058 collection is a great option if you are looking for Contemporary furniture in the Greenville, Spartanburg, Anderson, Upstate, Simpsonville, Clemson, SC area. Browse other items in the 7058 collection from Carolina Direct in the Greenville, Spartanburg, Anderson, Upstate, Simpsonville, Clemson, SC area.